Several days before Ademola Afonja ’19 suited up for his first game on the Regis men’s basketball team, he arrived to practice expecting to work on some last-minute dribbling, passing, and shooting. Instead, Coach Nate Hager handed him a detailed sheet of names and statistics. The sheet was a scouting report, an overview of the strengths and weaknesses of individual players on the opposing team. While Hager’s studiousness certainly prepares his team for games, it has also helped to fortify a culture of academic excellence within the basketball program. The players view their coach as a model of a successful student-athlete. 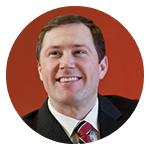 Hager is the first and only coach of men’s basketball—he began in the team’s inaugural season when Regis went coed in 2007. Since then, Hager has focused on establishing a winning program in order to recruit high-quality student-athletes. The coaches hold mandatory study halls for players who have a GPA lower than 3.0. But attending study hall has become a rewarding experience rather than an obligation. 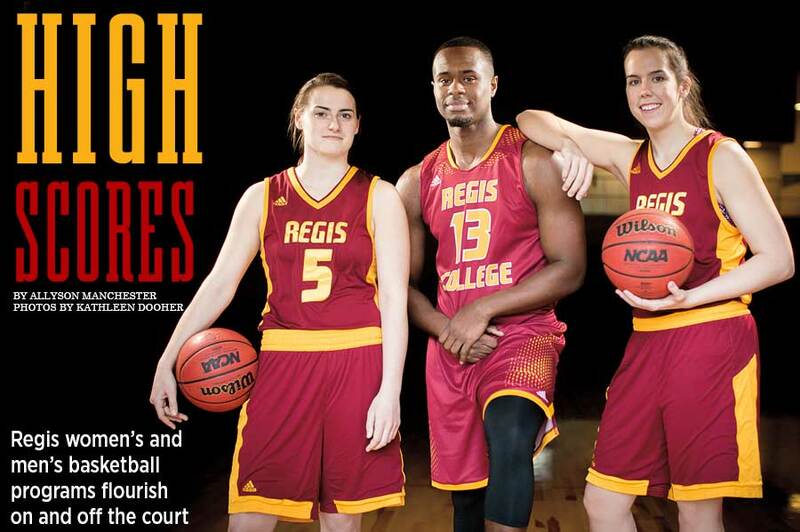 In the 2015-2016 season, the Regis women’s basketball team was the NCAA Division III women’s basketball statistical champion at Rebound Margin at 16.0 for the season. NCAA consecutive regular season wins began February 8, 2011, with a win over Western New England University. The streak includes the final four Commonwealth Coast Conference games—and every NECC game played (108–0)—bringing the current streak to 112. The previous NCAA record was 92, and was broken February 16, 2016, against Lesley University (122–52). Just across Higgins Court, Coach Angela Santa Fe (affectionately known as “Coach A”) leads the student-athletes on the women’s basketball team. The team is truly a force to be reckoned with. In February, the women clinched their fifth straight championship title in the New England Collegiate Conference (NECC). Explosive offense from Shannon Hayes ’18 and Brittany Stone ’18, as well as several impressive assists by Amanda Hawkesworth ’17, powered the Pride to a 92–49 win over number two seed Elms College. Still, their coach would argue that the victory had its roots in the classroom. When Santa Fe first stepped into the Regis basketball program in 2013, her team had a cumulative GPA of 2.7. She now coaches a team with a cumulative GPA on the cusp of 3.4. This is no small feat, especially considering that the players balance their academics with eight hours of practice and two to three games each week. Santa Fe keeps a watchful eye on the academic success of her team. She holds individual academic meetings several times each season; she monitors attendance; she asks to see semester grades as soon as they are published. “Coach A holds us to a high standard,” explains Hayes, a guard from Billerica, Massachusetts. The women on the basketball team respond well to this standard because Santa Fe knows how to balance rigidity and encouragement. “Coach A is your biggest fan and your biggest critic all at the same time,” says Stone, who has earned recent honors as a 1,000-point scorer and also the NECC Tournament Most Valuable Player. 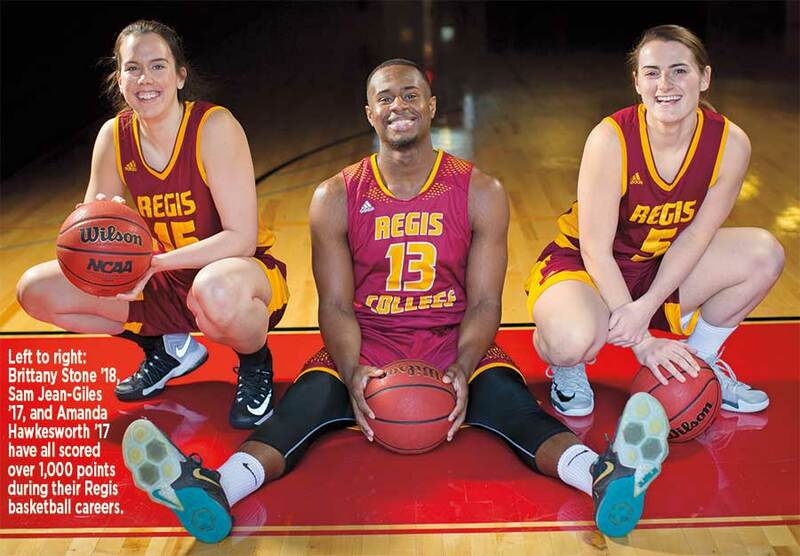 *Page and Chambers (pictured above) are the current career-scoring leaders at Regis. In a pre-practice ritual known as “Something Good,” Santa Fe calls the players to a huddle and encourages them to share positive moments from their day. Good grades are the most frequent contribution. Just as Hager and Santa Fe serve as inspiring mentors, the players on both Regis basketball teams have taken on mentorship roles in the community. Throughout the year, players organize fundraisers for the American Cancer Society and work with children in the Big Brothers Big Sisters program and at the Mission Grammar School in Roxbury, Massachusetts. One of the most successful basketball service projects involves participation in Coaches vs. Cancer, a nationwide collaboration between the American Cancer Society and the National Association of Basketball Coaches. Men’s career-scoring leader Ryan Chambers ’14, who Hager remembers as “the hardest working guy in the gym,” enjoyed combining the physical rewards of basketball with the emotional rewards of developing empathy and reaching out to the community. Additionally, the basketball program hosts a nine-team Special Olympics basketball tournament at Higgins Court every winter. Members of both the women’s and men’s teams help to run the scoreboard, referee games, and cheer on the athletes. From writing scouting reports to hosting the Special Olympics, the Pride players and coaches have become a powerful support system for each other and for the community. Their talents to be “part of something larger” truly reach beyond a college basketball team. Do you have any pre-game superstitions? 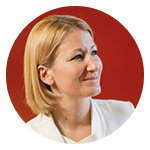 Santa Fe: I am not superstitious, but I do clean and organize everything possible in the office before each game. Hager: I will keep certain ties or suits going during win streaks. When is the most challenging point of a basketball game for you? Santa Fe: The most challenging part for me is my communication with the players in our post-game. I know this dictates how we will begin our next practice and our next game. Hager: The warm-ups. At that time, I can usually tell whether or not our players are focused. Who is your favorite professional basketball player or team? Santa Fe: Diana Taurasi [Phoenix Mercury]. Hager: Boston Celtics—I’m loving Jaylen Brown right now! Where is your favorite place to play basketball? Santa Fe: I love going back to my alumni game and playing at my alma mater, the University of Southern Maine. There is a strong nostalgic feeling I get when I enter that gym that I know will never fade. As far as coaching, in my four years we have lost five games at home, so I would say my favorite is definitely a home game at Higgins Court! Hager: Miller Sibley Courts in Franklin, Pennsylvania.